Velikost predogleda PNG datoteke SVG: 715 × 599 točk. Druge ločljivosti: 286 × 240 točk | 573 × 480 točk | 716 × 600 točk | 916 × 768 točk | 1.222 × 1.024 točk | 810 × 679 točk. 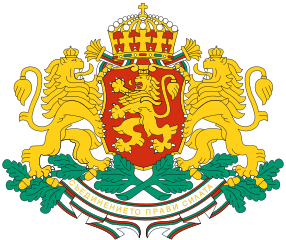 Vir The Law for the Coat of Arms of the Republic of Bulgaria, adopted on 05. 07. 1997 (in Bulgarian: lex.bg). 07:51, 30. junij 2011 678 × 571 (243 KB) Fry1989 oh come on, why is the lion coming up white? ?